Even to those dedicated fans of the Harry Potter series who have read every book and seen every movie, it can be tough to imagine how a magical sport like quidditch could operate in the real world without flying golden balls with wings and players soaring around on broomsticks. Some might be inclined to view it from the same perspective as they would with live-action role-playing, or LARPing, where spells and other mystical elements are "imagined" into existence. However, those who have seen this game in action know that the creators have condensed quidditch into a practical, physically taxing sport, where players cope with holding a shortened broom between their legs as a limitation or challenge instead of something fanciful. 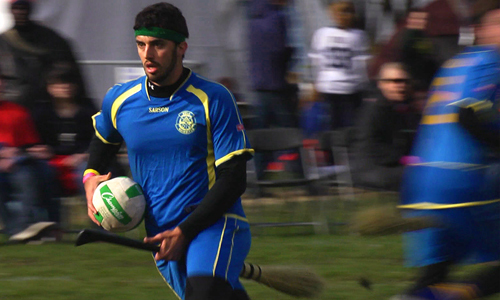 Explaining the sport's moving parts and legitimacy becomes one of the primary reasons for the existence of Mudbloods, which documents a year in live-action quidditch from the perspective of UCLA's squad, but its need to do so restricts some of the film's expressive potential about niche athletics and the complications of getting something new off the ground. Mudbloods takes place in 2011 amid the fifth-year anniversary of the quidditch World Cup, in which teams from across the world gather together to play this real-world version of the sport so whimsically portrayed in J.K. Rowling's books and in the series of Harry Potter films. One group trying to get there is UCLA's team, who constantly struggle with raising funds -- notably travel expenses -- and earning the respect of others on campus. Part of that stems from the fact that many people can't get beyond the "geeky" aspect of what they do to appreciate the dedication that the sport entails, and there's a lot: dubbed a cross being dodgeball and rugby, quidditch involves full-contact physicality and quick navigation and awareness of their playing field. While elaborating upon these facets, the documentary discovers its momentum in seeing whether the UCLA team can get to the tournament in New York and whether those efforts will ultimately be worth it when, or if, they get there. Mudbloods has a firm grasp on its audience -- people who don't look at you funny when they hear the word "Quidditch" -- and doesn't really try to be accessible to those who don't have a basic understanding of how it factors into the Harry Potter universe. Instead, the documentary explains how the sport transitions from book/screen to real life, touching upon the various positions and mechanics of the game in a fusion of game footage and cartoon visuals, and the rhythm of this comes across more like an instructional or recruitment video for the sport instead of an insightful documentary. From the perspective of someone who actually does know a thing or two about quidditch but who doesn't know anything about its live-action counterpart, that's not necessarily a bad thing: there's entertainment value to be found in the recognition and deciphering of its similarities and differences, in how it remains a co-ed game and how it grounds certain elements like the winged-ball Snitch. Documentaries need momentum as well, and that's a struggle for Mudbloods. The production has a destination in the form of the Quidditch World Cup located in New York, which gives the UCLA team -- as well as the coordinator of the event itself, league founder Alex Benepe -- something to constantly pursue amid the training, fiscal woes, and struggles with dismissive folks who don't get their passion. While there's an element of mild suspense in seeing how the underfunded, underdog team will get there and perform, the editing alongside the illustrated descriptions of how the sport functions yield something that's lacking in focus and emotional resonance with every hurdle crossed. There's interesting context and subtext in the camaraderie and struggle involved with getting quidditch, a facet of something as globally popular on a mainstream level as Harry Potter, recognized as a functional and valid sports league; however, that gets lost within the documentary's superficial, drawn-out exposition and diversions, including the intermittent catching-up with the person who's considered to be the greatest Harry Potter fan out there, Katie Aiani. Director Farzad Sangari deserves plenty of credit for what he's able to do with the Quidditch World Cup once Mudbloods gets there, though. Mirroring the likes of Friday Night Lights and Varsity Blues, he captures the sundown, spotlights-on enthusiasm that generates around an underdog team's arrival at the "big dance". The quidditch matches themselves are depicted with tumbling, kinetic no-frills handheld photography that frames the event in the kind of buzzing energy and expectation found in any other momentous sports event, bolstering the documentary's central aims in presenting this fanciful concept as a valid, demanding, and competitive sport. Unfortunately, not unlike certain other sports movies, Mudbloods must cope with an inherently anticlimactic finish to the UCLA team's journey, one that drags down the film's energy with the less-satisfying elements of regulations and tournament brackets. The resonance of this disappointment could be seen as the documentary scoring a goal in how it presents the live-action quidditch league, even if overall effectiveness remains just outside its reach.